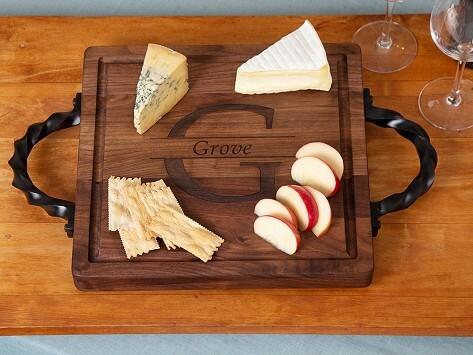 This personalized square serving tray makes a statement, or can make for a stand-out gift. It’s crafted from long-lasting and durable natural maple or walnut wood and finished by hand to let the wood's distinctive grain shine through. A laser-engraved initial adds a personal touch. Sturdy cast iron handles amp up the tray’s durability, while a juice groove, rubber feet, and rust-proof screws add to its functionality. Made in the USA. Dimensions: 14.5" x 14.5" x 2"
Big Wood Boards are, unsurprisingly, big on quality and finish. Maker Bill SanFelice and the rest of the Georgia-based group wouldn’t have it any other way. They’ve been at work since 2004 and take pride in their blend of new techniques and traditional craftsmanship that results in striking serving boards and trays with a personal touch. The sturdy trays, board, and lazy Susan are made with natural and long-lasting maple or walnut wood. They're tough enough for kitchen jobs (hello there, juice groove), and cast iron handles on the trays lend extra durability. Distinctive wood grain makes each board unique; adding a name or initial makes it even more so. And each piece is finished by hand, because Big Wood Boards wouldn’t have it any other way.